The family dog suffers in the summer heat, just as people do. If you are feeling uncomfortable ... assume your dog is, too. 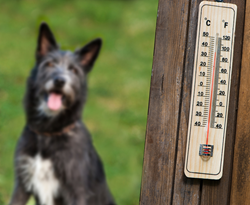 The three “H”s of summer – haze, heat and humidity -- are back and will take their toll on pets as well as people in the weeks ahead. “Our dogs suffer from the heat and humidity, just as we do,” says Traci Simo of Canine Company. “We need to take steps to keep them safe from common summer health problems like heat exhaustion, dehydration and parasites.” She offers these tips for keeping the family dog healthy, even in extreme heat. Preventing Heat Exhaustion and Dehydration. Be sure outdoor pets have a shady spot where they can get out of the sun. On very hot days, keep pets indoors in a room with air conditioning or a fan. A product like the Kool Collar, which comes with a reusable ice pack , can provide added comfort. Don't exercise a dog in midday heat. Keep potty walks between noon and 4 pm short; take longer walks in the cooler early morning or evening hours. Keep fresh water available throughout the day. For outdoor pets, a Cool Pup Faucet clips to any outdoor faucet so a dog can get fresh water with just a lick. Protecting from Skin Irritation and Parasites. Brush the pet’s coat frequently to prevent matting, which can cause hot spots, and shampoo often to remove dust and mold spores that can cause skin irritation. Use a flea and tick prevention product to keep parasites at bay. Don’t go overboard with summer haircuts. Unless a coat is badly matted, it’s best not to shave it off. A professional groomer can recommend the right cut for each dog’s breed and lifestyle. Born of a family’s love for dogs, Canine Company has been helping families keep their dogs and cats healthy, safe and happy for 35 years. The company serves pet parents across New England, New York and New Jersey with the Invisible Fence® brand systems, Manners dog obedience training, and mobile grooming and pet sitting in select markets. Its charitable Canine Love™ campaign supports pet rescue groups and donates pet oxygen masks to first responders. For more information, visit http://www.caninecompany.com or call 800-818-3647.